NOHC is a French quartet featuring Daunik Lazro (alto and baritone saxophones), Denis Colin (bass clarinet), Michael Nick (violin) and Didier Petit (cello and voice). NOHC stands for the chemical elements Nitrogen, Oxygen, Hydrogen and Carbon. 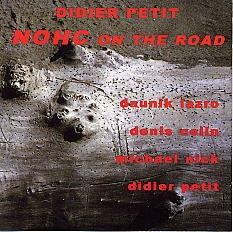 In October 1999, NOHC had a long tour of France recording every single performance; the best of these performances have been selected and released as NOHC on the Road; and alhough Didier Petit is the originator of this project, there is no central figure in creating this music - that would go against the laws of physics!